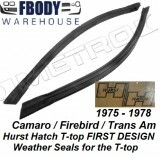 On your 1974 1975 1976 1977 1978 Trans Am and Firebird the weatherseals you choose will make or break your car. 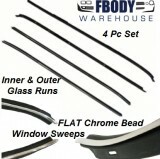 Seals are nearly as important as paint and they are seen throughout but more than that they complete your car. 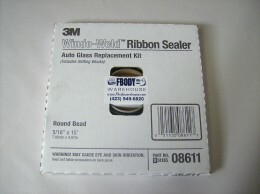 You can get great fitting seals that eliminate wind noise and which also keep the water out. 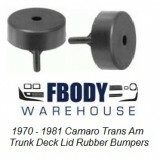 To do so you need a friend in the business and you have one with Fbodywarehouse. 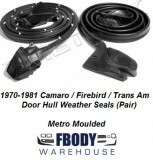 We offer only the best weather seals today. Brands such as Metro, Soft Seal, MCI, and others which all include a 15 year replacement warranty. Buy as a customizable kit or simply the parts you need. 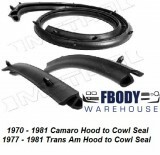 1977 - 1981 Trans Am Shaker Scoop Weather Seal *New* with Install Video! 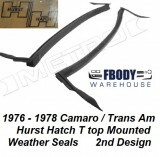 1970 - 1981 Camaro Trans Am HARD TOP WEATHER SEAL Kit "Customize to your needs"